Soooo the weather transitioning from winter to spring has really messed with my skin, including my scalp! My scalp is normally a bit dry (small white flakes) and not very itchy, but lately I've been seriously horrified by the volume of flakes I was seeing and the itchiness. My skin generally responds poorly to changing seasons, but it's the first time that even my scalp is going haywire. It was like I couldn't even exhale a breath without some tiny flakes falling >__< I'd been waffling about picking up a new shampoo for a while--committing to a full-size bottle is hard!--but I was extra motivated now because I had to deal with this crappy dry scalp. 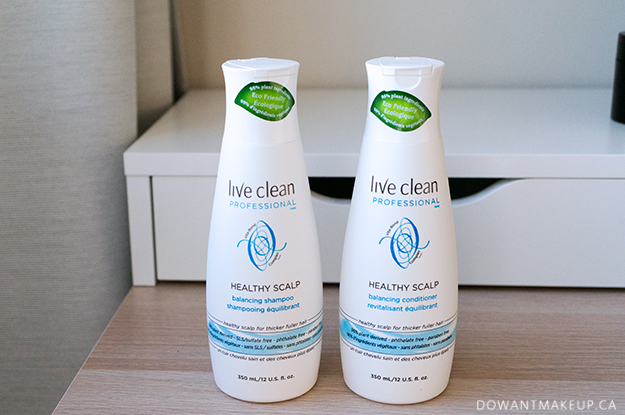 After a random trip to Shoppers Drug Mart, I unexpectedly was won over by Live Clean Healthy Scalp's ingredients list and $6.99 price tag. After I got home and got in the shower, I realized that I accidentally had picked up a bottle of the conditioner instead of the shampoo :( The ingredients between the two products are actually very similar, and co-washing is a thing anyway, so I tried using it like a shampoo, even massaging it a bit into my scalp and letting it sit before rinsing away. After a few days, I noticed way less flakes and decreased itch factor. While blowdrying my hair, I could feel with my fingers a little bit of "residue" left over (in fairness, I used a lot of product), but my hair didn't look weighed down. I think this has less to do with the oils which are in relatively low concentration, and more to do with the other conditioning agents higher on the list like the fatty alcohols and triglycerides. Over time, these might build up a bit and need cleansing with a mild shampoo. Lavender and rosemary extracts are also high on the ingredients list (#3 and #5) but I didn't see evidence as strong as other ingredients for the benefits. They're both believed to be soothing, but others have concerns that the aromatic compounds in such extracts are potentially irritating (Beautypedia is particularly vocal about this). These extracts are high on the list for several of Live Clean's hair care products, so presumably the folks there are really convinced of the benefits. My understanding is that the essential oil versions are more likely to irritate/sensitize compared to extracts, so I was okay with giving it a try (so far, no severe irritation noticed). On that note, there's also peppermint and tea tree leaf oils, but they appear so low on the list that I wasn't too worried about negative effects; at best these ingredients could have some soothing and anti-fungal properties. For cleansing, the shampoo uses a combination of sodium methyl 2-sulfolaurate, disodium 2-sulfolaurate, and sodium lauryl sulfoacetate, which according to this manufacturer document, is relatively mild--less harsh compared to sulfates, not as quite mild as a taurate or isethionate cleanser. I've used this to shampoo thoroughly after doing a DIY warm olive oil mask on my hair. It cleansed relatively well (after rinsing, my hair felt "rough" from the oil, fixed after a little conditioner), though my hair got a little oily faster than it would have if I hadn't used an oil mask at all. On my second attempt, I picked up the shampoo I meant to get in the first place and again, massaged it into my scalp and waited a few minutes before rinsing. I still have some flakes, but it's not as bad as it was before my first attempt. My hair feels cleansed but doesn't feel "squeaky clean" stripped; it also feels fairly soft and manageable. I bought it mainly to take care of my scalp but was pleasantly surprised by how my hair looked and felt. I don't think you need both products; I only meant to buy the shampoo and if I could do it again I would still buy only the shampoo. I treat my scalp and my hair as two separate areas of care that have different needs; my hair doesn't need the soothing, anti-inflammatory effects of the ingredients in the conditioner, which isn't moisturizing enough for my colour-treated hair. Moreover, based on the relative position of each product's phenoxyethanol (a preservative that would be maybe 1% concentration at most), I think the conditioner might have less salicylic acid and coconut/olive oils than the shampoo? The more I think about it though, the more I wonder if the salicylic acid provides much benefit in either product. Salicylic acid needs time to do its thing, and I'm not sure if 2 minutes in the shower is enough. It also needs a lower pH (ideally 3-4), and after some testing, I think it's around a 6, which further lowers the effectiveness. The improvement from my scalp might be more from soothing/moisturizing ingredients and relatively mild cleansing agents. Random interesting thing I learned researching the ingredients list: I got a little freaked out to find a bunch of articles about using vitamin C tablets (made of ascorbic acid, which is low in the ingredients list) as a hack to lift unwanted hair dye. Something about the ascorbic acid is able to break up the dye bonded to hair. I definitely do not want my dye lifted, but it seems like this trick is mainly for semi- or demi-permanent hair dye (mine is permanent) and may be in a small enough amount to not do much damage (many articles recommend crushing several tablets and mixing in with a harsh clarifying shampoo, which is also stripping to dye). I didn't notice much dye washing out when I used it myself though. I still think the shampoo is worth checking out if you feel like your current shampoo is leaving your hair/scalp feeling stripped and dry. (FYI I couldn't find the Healthy Scalp line at most retailers that carry Live Clean, for some reason I only saw it at Shoppers Drug Mart.) If you are struggling with a dry scalp, I also strongly recommend trying to wash your hair in lukewarm or cool water and overall washing your hair less. Hot water can dry out your scalp, as can repeated exposure to water from frequent washing. TL;DR: if you have a dry scalp, check out the Live Clean Balancing Shampoo, which may help flakes due to some soothing, moisturizing ingredients, relatively mild cleansing agents, and (maybe) salicylic acid, an exfoliant. Be on the lookout for potential irritation from essential oils and extracts in the formulation. How do you handle a dry, itchy scalp?